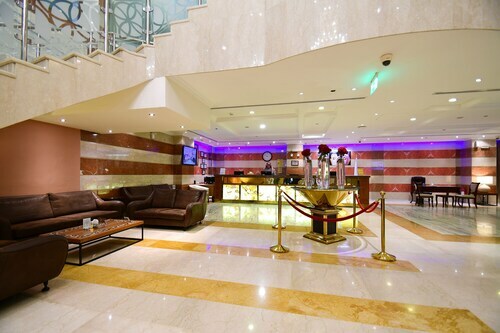 Located in the heart of Medina, this luxury hotel is steps away from Al Haram and Bin Dawood. Al Noor Mall and Quba Mosque are also within 3 mi (5 km). 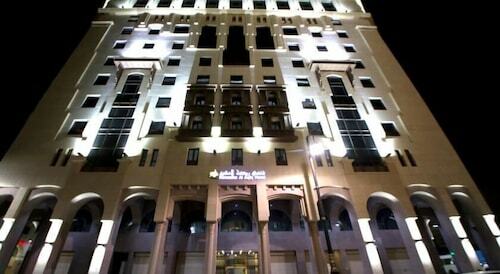 Located in the heart of Medina, this hotel is within a 5-minute walk of Al Haram and Prophet's Mosque. Bin Dawood is 0.7 mi (1.2 km) away. Situated in Medina, this hotel is within 1 mi (2 km) of Baqi Cemetery, Al Haram, and Prophet's Mosque. Bin Dawood is 0.8 mi (1.3 km) away. 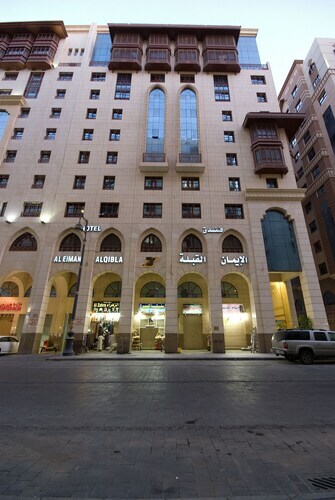 Situated in Medina, this hotel is within a 10-minute walk of Al Haram and Bin Dawood. Prophet's Mosque is 0.8 mi (1.4 km) away. 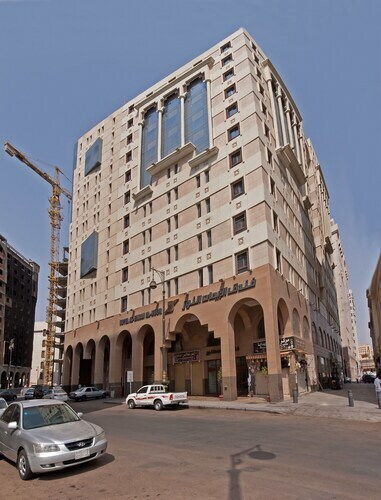 Situated in Medina, this hotel is within a 10-minute walk of Al Haram and Prophet's Mosque. Bin Dawood is 0.9 mi (1.4 km) away. 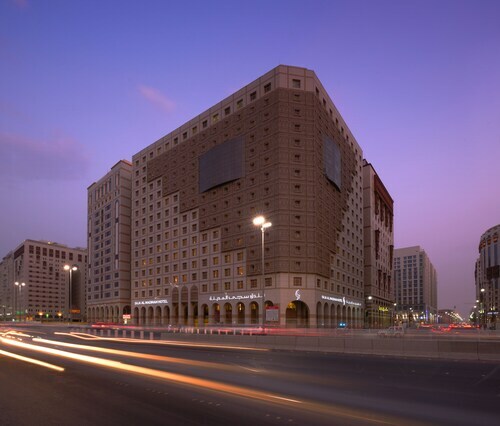 Located in the heart of Medina, this luxury hotel is within a 10-minute walk of Al Haram and Bin Dawood. Prophet's Mosque is 0.8 mi (1.3 km) away. So, you're thinking about a holiday to Medina? If you'd like to find accommodation that's located near the sights, you can enter your holiday dates and then use the filters next to your hotel search results to find a hotel near the area's attractions. You can choose among 160 Medina hotels and accommodation options to find a place you'd like to stay. When you're thinking about where you want to stay in Medina, you'll be able to quickly and easily search ebookers for hotels offering services such as high-speed Internet, free airport transport or a swimming pool. You can take advantage of the filters to narrow down your search for a hotel, so you can get the services that are important to you, such as air conditioning or an in-room kitchen. When arranging your Medina getaway, you can also use ebookers to look for a convenient flight into Medina (MED-Prince Mohammad Bin Abdulaziz) Airport. You can narrow down your search by number of stops, airline or time of departure to find the one that'll meet your needs. When is the Best Time to Explore Medina? If you're curious when is the best time of year to visit Medina, you may find this information about seasonal weather helpful when you are organising your getaway. The warmest months in Medina are typically June and July, whereas the coldest months are usually January and February. The months with the most rain are December and March, whereas January and February have the least. From January to March, the average daytime temperature is 32°C and at night it is 11°C. Seasonal average rainfall is 1 mm. If you visit between April and June, you can expect an average temp of 43°C during the day and 19°C at night. Average rainfall during this season is 2 mm. The daytime average temp from July to September is 39°C and the nighttime average is 12°C. Average precipitation for this season is 2 mm. The average annual rainfall in Medina is 5 mm. The receptionist's behaviour was odd but he gave us a suite overlooking Masjid e Nabwi from the room window. Porter and other cleaning staff was very demanding, indirectly drawing the attention to pay some tip. Room was good and clean. It was 6-8 minutes away from the Masjid. It's not a 3 star hotel, not more than a 1 star hotel. Not clean and very small room and toilet. We booked double room but it was so small that you can't even pray in the room, i moved luggage rack to offer prayer. Hot water was boiling hot, burnt my leg which slightly touched the hot water pipe. No kettle in the room, no water bottles provided in the room. Iron was not provided, in fact, they don't allow iron, kettles, heaters etc. in the room. It is 5-8 minutes away from the Haram. It was cheap but wouldn't recommend anyone. we had booked Deluxe room which sits above classic & superior and below executive suites. Best feature was the view of Al-Masjid an-Nabawi. Apart from that room was anything but Deluxe. It was very small and i could hear everything from next door, from phone calls to alarm in the middle of the night. Definitely Not worth the money they charged us, unfortunately. Good location near to Haram. Rooms are big. Hotel is close to Movenpick hotel. Location: is very good. It is near the Gate 1 for Roza e Rasool. Cleanliness is extremely poor. The carpets were very dirty with marks. Facilities: The single twin room rooms had very tiny beds perfect for midgets but not suitable for a normal 6 feet tall man. Services: The services are really really poor. If you are a foreigner they will deal with you differently and only locals are dealt first even if you are ahead in the queue. There is no queue system. They are not so friendly and helpful if you are a foreigner. This hotel is well below 1 star mark by UK standards and nowhere near 3 stars. In a nutshell if I go to Madinah again I will never book this hotel.